Several years ago, Anselme Selosse took me to see a massive construction site that was to become a luxury hotel and home to his new cellar. His plan for a small hotel and restaurant in the center of Avize was hugely ambitious. What else is new? Anselme Selosse remains one of the most revolutionary producers in Champagne. Along the way, Selosse has also influenced countless other growers, a part of his legacy that may very well prove to be the longest lasting and most profound. Les Avisés is very much a family affair. Selosse and his wife, Corinne, have created a style of elegance that also has an element of intimacy and less of the stuffiness one sometimes sees in Champagne. Every detail reflects total attention and passion for the very best; from the chocolates in the rooms to the artisan fruit juices served at breakfast. A stay at Les Avisés is also the best way for wine lovers to visit the domaine, which is otherwise hard to do. Tastings for hotel guests are held Saturday mornings and Monday afternoons, but the schedule can change, so confirming ahead is always a good idea. Stéphane Rossillon and his wife run the small restaurant. I have been following Rossillon since the days when Les Avisés was still in its developmental stages. Rossillon is a rare breed; a French chef whose cooking is driven more by seasonal ingredients rather than by technique. The restaurant has one communal table and a few smaller tables. Hotel guests have priority, but diners who aren’t staying in the hotel can eat in the restaurant if space is available. Every day the menu is hand-written on a chalkboard. 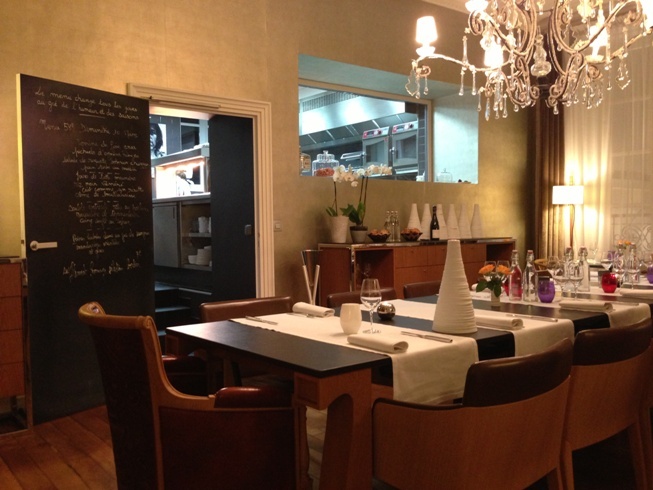 One set menu is offered for everyone, so Les Avisés is not the best choice for picky eaters. Every meal I have had at Les Avisés has been superb. The wine list has an excellent choice of Selosse Champagnes, along with wines from producers with whom Selosse has a personal affinity. There are plenty of great choices to tempt diners, including many hard to find grower Champagnes, as well as selections from a number of top-notch properties. 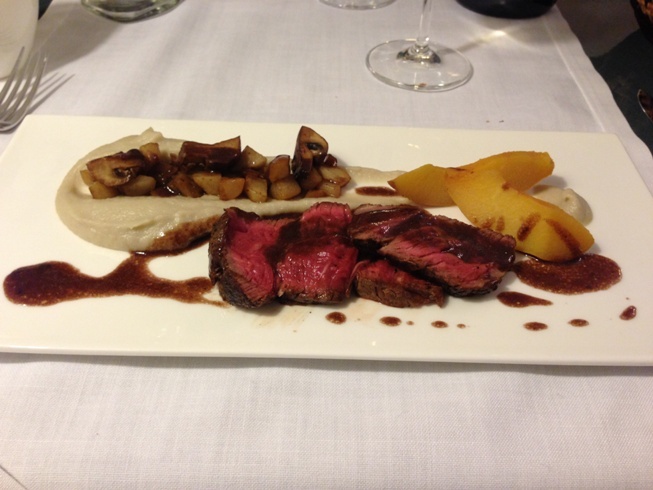 My most recent dinner was another in a series of fabulous meals at Les Avisés. The foie gras terrine, such a staple of French cuisine, was elevated by sheer attention to detail and the perfection of all of the accompaniments. There was no wasted motion here. 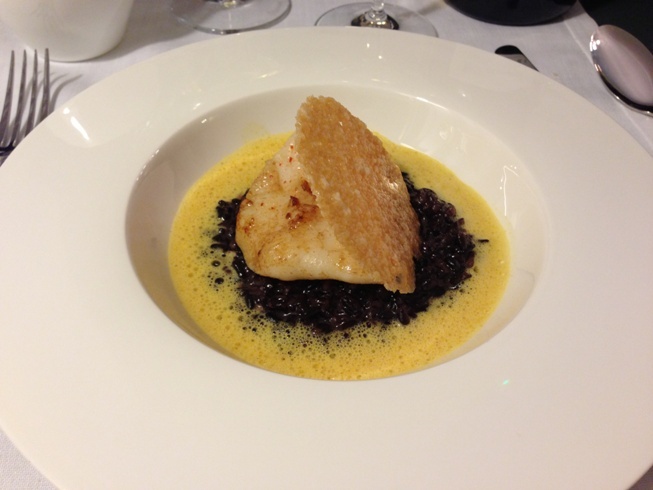 I loved the monkfish cheeks with black rice risotto, a dish that shows Rossillon at his finest. The double entrecôte of beef was cooked a perfect medium-rare and full of flavor. I don’t usually eat dessert, but how could I pass on the poached pears? I couldn’t. I did skip wine, though, as I rarely drink with meals when I am on tasting trips. What would I have had? Maybe a personal favorite, Selosse’s Ambonnay Le Bout du Clos, or an older vintage of Domaine de Trévallon, or maybe Soldera’s Brunello di Montalcino Riserva. The options are many. Every region has places where wine people tend to gravitate. Les Avisés is one of those places. The hospitality and food are superb, a visit to the domaine is a rare treat, and the location, right in the heart of the Côte des Blancs, could not be better. Anselme and Corinne Selosse can add Les Avisés to their brilliant track record of successes.